The world’s war on coal is making its biggest producers a lot richer, at least for now. Anglo American Plc, Glencore Plc and BHP Billiton Ltd. are generating the highest profits in years from their coal mines. Income for the 37 coal producers tracked in a Bloomberg Intelligence index was the highest in six years. It all comes down to the simplest equation in business: supply and demand. With governments from Asia to Europe setting stricter pollution limits as the climate change debate intensifies, output of the planet’s dirtiest fuel is dropping. Income for the 37 coal producers tracked in a Bloomberg Intelligence index was the highest in six years. Some of the more significant declines are occurring in China, the top mine operator, and financing for new supplies is drying up. That’s creating a windfall for the producers who remain. Concern over tightening supplies has revived prices. European coal for export has almost doubled from the lows of 2016, and U.S. futures are 50 percent higher on average in 2018 than two years earlier. One reason for the output slide is the lack of coal-industry financing. With growing concern about climate change, lenders shrank funding for the industry to $14.9 billion last year from $22.5 billion in 2015, according to BankTrack. At least 15 of the biggest banks have policies that prevent investing in coal projects. JPMorgan Chase & Co., HSBC Holdings Plc and Credit Suisse Group AG won’t fund new mines, while Societe Generale SA and Deutsche Bank AG go even further with bans on loans for coal-fired power plants. And it’s not just banks. Big investors are increasingly turning their backs on coal. In 2012, activist group 350.org started the climate divestment movement. So far, more than 850 institutions have committed to quitting coal investments. Norway’s $1 trillion sovereign wealth fund, the world’s largest equity investor, sold off most of its coal stocks. California lawmakers required the state’s pension funds to divest any coal holding. Asset managers including Allianz SE, Swiss Re AG and Storebrand ASA have similar policies. Australia’s $2.3 billion Carmichael coal venture illustrates the challenge. Prices are the highest in six years, and the government was so eager to get production started that it overruled concerns the project could damage the Great Barrier Reef. Despite that support, developer Adani Enterprises Ltd. is struggling to get funding and has abandoned a 2020 target date to begin mining. It’s already been rejected by three Chinese banks and lenders including Goldman Sachs Group Inc. to Investec Ltd. Even big producers — which have deep enough pockets to build projects without bank support — aren’t interested in adding to supplies. Melbourne-based BHP has said the world needs to combat climate change by reducing harmful emissions. 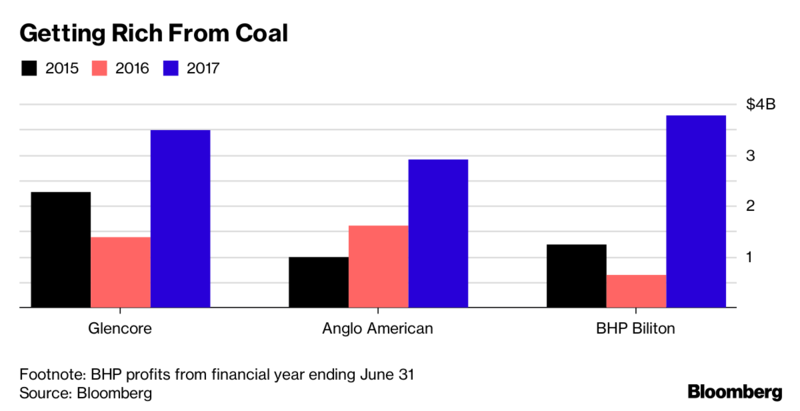 London-based Anglo American says burning coal will increasingly be contested by governments and consumers, and that use of the fuel will ultimately decline. Anglo American cut production by 20 percent in the past five years and won’t spend any more money on its existing mines. BHP, which mostly mines coking coal used to make steel, plans to run its thermal coal mines for cash, while it focuses on commodities like oil and copper. Rio Tinto Group sold all its mines. Glencore, the top seller on international markets, is the only major producer committed to the fuel. The Baar, Switzerland-based company is buying mines from rivals, but the company says it won’t build new ones. While declining supply should support profits for those still mining the fuel, the industry remains at risk. Most thermal coal mined each year is used by domestic power plants, leaving less than a fifth of output available for the export market, which is dominated by China. China burns five times as much coal as the U.S., and it both mines and imports more than anyone else. The Asian country relies on overseas purchases to make up for domestic supply shortfalls. That poses a “cliff edge risk” for companies including Glencore and Anglo, because even a small drop in Chinese consumption could have a disproportionate impact on international demand, according to Stansbury, the Legal & General fund manager. In 2016, prices for thermal coal more than doubled after China curbed production. Desperate to address a chronic air-pollution problem by reducing industrial emissions, China has continued to mandate further cuts. In March, it pledged to shrink coal output by 150 million tons this year and steel capacity by 30 million tons. Imports of coal may drop in 2018 for the first time in three years, according to Bloomberg Intelligence. Ultimately, higher prices for coal could accelerate the shift toward cleaner fuels. Already, competition has increased from power stations running on natural gas, wind turbines and solar panels, all of which are getting cheaper to build and operate. That’s eroding the economic argument for continuing to burn a fuel with such high emissions, even in developing countries. Toxic levels of pollution led to the early annual death of an estimated 7 million people, according to a new World Health Organization report.